If a woman conceives and bears a male child, she shall be ceremonially unclean seven days…If she bears a female child, she shall be unclean two weeks…. I am going to be honest. There are still many things that cause me to scratch my head as I journey through God’s Message. I am content to accept the fact that my 21st century American brain cannot completely fathom the realities of life in the middle east c.1500 B.C. It does not stop me from being curious and inquisitive. There is no doubt that ancient cultures, by-and-large, valued male births more than female births. It was a brutal period of human history. Daily life was a bloody, violent version of “king of the mountain.” Wars between tribes, clans, and towns waged non-stop. Power ebbed and flowed through never ending battles of local conquest. Boys became warriors and hunters required to protect, provide, and conquer. The more things change, the more they stay the same. In the past year there has been a lot of press about China’s infamous program of population control, and the Chinese government’s moves to change the policy now that its unintended effects are shaking their society. Over the years China has gone to horrific lengths to control the birth rate of their people. Hearkening back to the misogynistic practices of history, male births were preferential to female births. According to one report, by 2020 there will be 30 million more men in China than women. A certain amount of societal chaos is now anticipated. Beyond the natural, cultural considerations, however, there is a spiritual context that has to be considered. Going back to the Garden of Eden, to original sin, and to the harsh spiritual realities that were unleashed at the beginning. God speaks to the Serpent, to Eve, and to Adam of the consequences of their willful disobedience. Among the woeful, core consequences is “hatred” between the serpent and the woman. Misogyny is evil, and at the very beginning of the Great Story we see that Evil (a la, the Serpent) is expelled from the Garden with a core, misogynistic hatred of women. The never ending power struggle between male and female is also alluded to as a foundational spiritual consequence of the Fall and continues to be a hot topic in our society, our political campaigns, and our current events. This morning I am, once again, amazed that God saw fit to surround me with strong, beautiful, capable, intelligent, wise women. I will confess to you that, in certain moments of life, I have experienced pangs of that common male desire to have a son and occasional pangs of grief that it was not part of the plan for me. Fascinating to think about in the context of today’s thoughts. Nevertheless, I have been blessed to be surrounded by females, and it has made me a better man. This morning is one of those mornings when I walk away from my quiet time with more questions than answers, more curiosity than certainty. I am, however, thinking about the women in my life. I’m thinking how much I truly honor and appreciate them and their femininity. I am again inspired this morning to continually root out deep seated misogynistic tendencies in my own heart, and to seek ways to join the struggle against the enmity against women that has been present from the Fall. I have been surrounded in this life journey by women, and I love ’em. 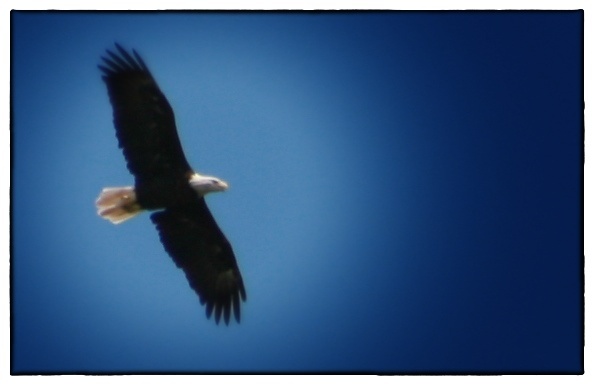 A photo I snapped of the eagle soaring over our cove a few summers ago. When I was a child in elementary school, I remember studying the American bald eagle and how near they were to extinction. I have memories of thinking that I might never see one and how sad that would be. The few that did exist, I was told, were in the wild of Alaska or the Rocky Mountains far from my home on the rolling plains of Iowa. Much to my joy, bald eagles have become a fairly common sight near my Iowa hometown in recent years, though the sight never ceases to stop me in my tracks and fill me with wonder. Conservation efforts have worked. At our place on Lake of the Ozarks in Missouri there are eagles which nest in the back of our cove. There is nothing quite like the sight of that giant raptor with it’s snowy white head and tail soaring right over you. This summer we even had the treat of watching a young eagle dive into the shallow water at the back of the cove over and over and over again learning to catch fish. God’s questioning of Job in today’s chapter focuses on His sovereignty and care over creation. I find it interesting that creation has a natural order to it which God set into motion. It fascinates me how the animal and plant kingdoms operate in symbiotic relationships and function amazingly well in the propagation of life and the natural environment. Humanity has a way of coming along and messing things up more often than not. I would argue that it is a consequence of the Fall, and perhaps that is part of God’s point to Job. I’m looking forward to seeing the eagles again at the lake this summer. They remind me that there is hope of redemption, even at the brink of extinction. A eucatastrophe in nature. This summer there will be an added layer of meaning as I remember God’s questioning of Job, and me. I am a lover of the underdog. I don’t know why it is that I have taken this scourge upon myself, but I have. In baseball season I cheer for MLB’s “loveable losers” the Chicago Cubs who have been cursed to have not one a World Series since 1908. During the football season I cheer for the Minnesota Vikings whom I watched lose four Super Bowls in my childhood and have never seen them return. Even in our own collegiate, in-state rivalry here in Iowa I tend to pull for the underdog Cyclones over the more popular and historically successful Hawkeyes. People will often ask me why I just don’t switch allegiances and go with a “winner.” It takes faith to cheer for the underdog. You gotta believe that the big victory is so much sweeter when it happens. Of course, the corollary to cheering for the rare underdog victory is the sweetness of watching the mighty fall. I have always enjoyed watching the “sure thing” fall apart. I remember as a kid when the headline on the sports page proclaimed Houston as the winner of the NCAA basketball finals before the championship game was even played. That was before NC State pulled out one of the most improbable upsets in recent sports history. I love it when the “sure thing” proves not to be so sure. That’s exactly the theme of Obadiah’s message. 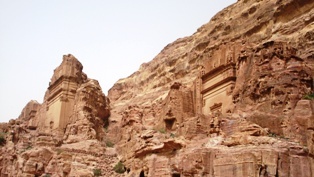 The nation of ancient Edom built their homes in a network of caves high in the cliffs of the local mountain range. An invading army had no good way of assailing them successfully. And so, the Edomites felt smug and secure in their cliff top caves. Survival was a “sure thing” because no one could reach them up there. Obadiah’s message was a reminder of a constant theme throughout God’s Message: pride comes before the fall. Today, I’m reminded to be grateful for all of my blessings. There is nothing that is a “sure thing” in this life. I pray I never get to the point of feeling a smug sense of security (at least I have both the Cubs and Vikings to remind me of that throughout the year).